In Part 3 of my countdown through my favourite singles from 1999, I talked about the wave of blonde female singers who flooded the charts in Britney Spears' wake. There's another of those to come in this part (and, of course, Britney herself), as well as a couple of boy-girl pop groups launched in the UK following the success of Steps. Yes, yes, we'll get to S Club. Before that, the return of one of Britain's most successful female singers of the '90s. "Sunshine" was the first single from Gabrielle's third album, Rise, and while it returned her to the UK top 10, she had a bigger hit up her sleeve. For me, though, it was the highlight of the album - and also worked as a pop/dance song thanks to a Frankie Knuckles remix. Anything Pete Waterman can do, Mike Stock and Matt Aitken can do... not quite as well, in this case. Clearly modelled on Steps (boy-girl members, cheery pop songs, easy-to-learn dance routines), Scooch not only had one of the worst names in pop but, on the plus side, managed to get Stock and Aitken to start writing original songs again instead of just producing dodgy cover versions, which they'd done throughout the second half of the '90s. "When My Baby" was a good start for the Scooch project (although its number 29 peak in the UK would suggest otherwise), but there were better things to come for the short-lived group. With Boyzone getting a bit long in the tooth - in boy band terms - by 1999, it was time for a new Irish quintet to step into their shoes, and Westlife (originally named Westside) was formed by Boyzone manager Louis Walsh. In a tidy bit of torch-passing, Ronan Keating, who began his solo career in 1999, was even billed as Westlife's co-manager - something he possible regretted when the group knocked his debut single, "When You Say Nothing At All", off the number 1 spot in the UK. Rubbing more salt in the wound was the fact that Westlife scored UK number 1 hits with all four of their 1999 singles: "Swear It Again", "If I Let You Go" (number 6 on this list), "Flying Without Wings" (number 34) and "I Have A Dream/Seasons In The Sun" (number 189). As impressive as Boyzone's chart performance had been (16 straight top 4 singles), Westlife were doing even better. Jive Records had Britney, RCA had Christina and, in 1999, Epic launched Mandy Moore as their blonde hopeful. Never as big a chart hit in the US (where the chart is heavily skewed to airplay) as it would eventually be in 2000 in the UK and Australia, the song sold well and was incredibly popular on MTV's Total Request Live. Mandy, who was only 15 when "Candy" was released, didn't go on to have as illustrious a music career as her contemporaries, but has transitioned more successfully into acting than either Britney or Christina have so far managed. Side note: the YouTube screenshot below must be one of the most unflattering of all time. If Five were the bad boys of pop, then a1 were right at the other end of the boy band spectrum. Launched in 1999 by the team who'd created the similarly squeaky clean Steps, a1 were as cheesy as pop gets. Still, a good song is a good song - and a1 had enough of those to spare, including this debut single and follow-ups "Summertime Of Our Lives" (number 79 on this list) and the double A-side "Everytime/Ready Or Not" (number 59). Actually, "Everytime" wasn't that great, but the decision to team that drippy ballad with the upbeat "Ready Or Not" was another thing a1 - and many pop acts in 1999 - copied from Steps and their million-selling UK number 1 "Heartbeat/Tragedy". While Pete Waterman's other pop act, Steps, were chugging along quite nicely, he took another go at turning this 1991 Boy Krazy single (which reached number 18 in the US in 1993) into a UK hit. Unfortunately for Pete - and three-piece Toutes Les Filles (Cheryl Jay, Vicky Dowdall and Nikki Wheeler) - the song just wouldn't connect with the British public, and it stalled at number 44. Although not quite as good as the original, I thought it was a capable version. Let's have a breather from the pop onslaught for one of 1999's biggest dance records. Featuring vocals from "Reach Up" by Toney Lee, "Turn Around" was a number 2 hit in the UK and was quickly followed by "Feel Good" (number 71 on this list) and "Tonite" (number 196), both of which featured original vocals by Ben Ofoedu (who lip synced in the "Turn Around" video). Phats & Small were British duo Jason "Phats" Hayward and Russell Small, and although they're really only remembered for this song, Russell would go on to form another duo, Freemasons, who we'll be seeing a lot of in my 00s countdowns. Straight back into the pop - and it doesn't get cheesier than this. Except for a1. Another soap star trying their luck at a music career, Adam had been on Coronation Street for the previous couple of years and established enough of a fan base to earn a UK number 5 hit with this debut single. All blond floppy hair and chiselled abs, he was targeted quite clearly at pop music's main two markets: teenage girls and gay men - but both abandoned him in droves for the follow-up, "Everything My Heart Desires" (number 36 on this list and also recorded by Mandy Moore for her debut album), which charted 10 places lower. In 1988, it was one of the first big house hits in the UK (and in my top 100 for that year). Eleven years later, "Good Life" was revamped and re-recorded - with a Latin twist - by Inner City's long-time musical director, Tommy Onyx. The remix returned Inner City to the UK top 10 for the first time in a decade, and it's the version I actually prefer of the song. Backstreet came back - again - in 1999 with what would be the biggest album of their lengthy career, Millennium. The band's third (or second, if you were in America) album featured their highest-selling single, "I Want It That Way" (number 3 on this list), as well as this follow-up, which came with one of the most expensive music videos of all time. Millennium's record-breaking sales (over 1.1 million copies in a week in the US) would throw down the gauntlet to rival boy band 'NSync, who'd return fire in 2000. With a name like Mirrorball, you'd be expecting some disco action - and the British dance duo didn't disappoint with this track, which sampled The Three Degrees' 1978 single "Givin' Up, Givin' In". Mirrorball was comprised of Jamie Ford and Jamie White, who we saw back in Part 1 as a member of 3 Jays - and they only managed one more single in 2000. The first single proper from the Synkronized album was probably the poppiest thing Jay Kay had released up until that point. As a result, "Canned Heat" became the band's biggest hit up until that point in Australia, where it reached number 20, and also wound up on a couple of film soundtracks - notably Center Stage and Napoleon Dynamite. It would be the only major single from the album, which also included "King For A Day" (number 99 on this list). 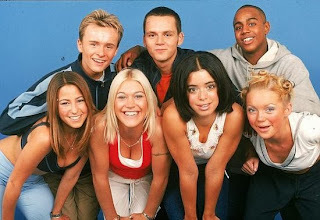 I remember being completely unprepared for the sudden arrival of S Club 7 on the British chart with this debut single - but then I hadn't ever watched Miami 7, the kids' TV show which launched the mostly-singing, all-dancing act. I also remember thinking seven was probably too many people for a pop group, but Hannah and Tina were really just there to make up numbers (as far as the music was concerned, anyway). Although they threatened to oust Steps from their rightful position as the UK's top boy-girl pop group (which didn't sit well with me), there was no denying "Bring It All Back" was a great pop song. As was "S Club Party" (number 25 on this list) and the double A-side combo of "Two In A Million/You're My Number One" (number 24). By the end of 1999, something told me we'd be seeing Tina do her dance, Jon look for romance, Paul get down on the floor, Hannah scream out for more, Bradley swing, Rachel do her thing and Jo sing most of the lead vocals for some time. At the end of 1998, I took over a friend's rent in a flat in London that came equipped with Sky TV - which meant I suddenly had access to The Box, MTV and all the other music channels. That Christmas, this debut single by the American teen singer and former Mickey Mouse Club star was on constant rotation. Although the single didn't get released until early 1999 in the UK, I knew it would be huge. Just how huge, I'm not sure anyone could have predicted. Famously offered to TLC, who turned it down, "...Baby One More Time" became the year's highest-selling single in Britain and topped charts all over the world, including back in Australia, where it was only prevented from being the year-end champion by Lou Bega. The song was quickly followed by "Sometimes" (number 100 on this list) and "(You Drive Me) Crazy" (number 18), which proved the success of "...Baby One More Time", while massive, would not overshadow everything that followed it. Indeed, it was only the beginning. Barely pausing for breath, Steps moved swiftly on to their second album in 1999, launching it with this single - one of five number 2 hits they scored in the UK. By now, the formula was locked in - catchy song, brightly coloured matching outfits, a dance routine with the moves explained in the CD single artwork and never-faltering smiles. Although they didn't win that year's BRIT award for Best Breakthrough Act (as was widely predicted), they got their revenge on the UK chart with songs like this, "Better Best Forgotten" (number 8 on this list), "Say You'll Be Mine/Better The Devil You Know" (number 10) and "After The Love Has Gone" (number 21) - as well as a major role in the all-star ABBA tribute, "Thank ABBA For The Music" (number 102). 54 STAND BY YOU S.O.A.P. That's it for the '90s - and just in time for Christmas, too. This Wednesday (Christmas Day! ), my final ARIA recap from 1988 will go live, and then between Christmas and New Year I'll count down my top 100 for 2013. Happy holidays! "the YouTube screenshot below must be one of the most unflattering of all time" - ha ha, occasionally when I upload a video, it yields an unflattering still of the artist... or even worse, the still (or any of the 3 stills you can choose from) doesn't feature the artist at all.